It was a day for quake, rattle, and roll on the west coast when small earthquakes hit both Los Angeles and the Pacific Northwest on Tuesday. While the pair shared common characteristics, the stories behind why they happened reveal dramatically different Worst Case Scenarios for future earthquakes. At 5:48pm local time on Tuesday, Los Angeles was shaken by a magnitude 4.4 earthquake. A few hours later at 11:39pm local time, Vancouver was rattled by a magnitude 4.8 earthquake. Both their epicenters were 48 miles (78 kilometers) away from the largest nearby city: the LA earthquake was northeast near Devore, while the Vancouver earthquake was southwest near Victoria. The LA earthquake was shallower at 4 miles (6 kilometers); the Vancouver earthquake was deeper at 32 miles (52 kilometers). That difference in depth is a hint about their dramatically different origin stories. Both earthquakes were quite small, with excitement-generating moderate shaking but no substantial damage or injuries. Measuring Earthquakes: What’s in a Number? What’s the difference between a 4.4 and a 4.8 earthquake? While the numbers seem very similar, thanks to the complexities of how we measure earthquakes that 0.4 difference means quadruple the energy released. You’ve probably heard of the Richter Scale for earthquakes, but scientists don’t actually use it. The Richter Scale attempted to quantify the energy released by the earthquake—the magnitude—but it only worked at specific distances and sizes of earthquakes. Instead, we incorporate globally-acquired data to measure the moment magnitude (Mw) instead. Like the Richter Scale, the moment magnitude is a logarithmic scale. Every step up represents a 10-fold increase in the amplitude of an earthquake wave measured by a seismograph, and 31 times more energy released. While a Mw4.4 and Mw4.8 don’t sound that different, the Vancouver earthquake released a hefty four times as much energy. But magnitude doesn’t fully encompass what we actually feel from an earthquake. Local geology and surface materials modify shaking. Soft sediments amplify earthquake waves, making the earthquake worse, while hard rock can deflect or attenuate the waves, spreading the energy elsewhere. To quantify this, scientists look at the felt intensity. Since a single earthquake can have multiple intensities depending on local conditions, it’s very difficult to measure. This is a frustrating challenge because intensity is how people and buildings experience the earthquake, so it is the most important part for disaster planning. Geological surveys run ground motion detectors to collect spot-data for shakemaps, but the real flood of data comes from people filing Did You Feel It? reports describing their observations of an event (including if they didn’t feel it at all). This data is automatically compiled into maps, but more importantly it is used by scientists to refine their models to better anticipate local shaking from future earthquakes. Gizmodo staff witnessed both earthquakes. For the afternoon earthquake in Southern California, Jennifer Ouellette was in her third-floor office writing merrily away—her husband felt it, while she assumed it was just a truck passing nearby. Alissa Walker was outdoors and missed it completely. For the northern quake, I was watching movies over ten stories up in a highrise where the building’s sway exaggerated the shaking. The room jolted like a cheap apartment nestled next to a railway junction, yet when I started chirping, “Earthquake!” my friends were utterly convinced I was pranking them. It was all over too quickly to drop, cover, and hold on, and too mild to need to. All our experiences are completely normal for a magnitude 4 to 5 earthquake. Their intensity is commonly described as light (IV) to moderate (V). Qualitatively, that’s shaking strong enough to be felt by nearly anyone indoors, and possibly those outdoors. It’s strong enough to wake up people who are asleep. A light to moderate earthquake rattles dishes, doors, and windows, and on the strong end near the epicenter, might break fragile objects. It’s noisy: walls make cracking sounds although they’re rarely damaged. Many people describe these moderate earthquakes as being easily mistaken for a truck passing. Our planet’s surface is covered in rigid, flexible tectonic plates. As they move, they get caught and stuck. Stress builds up until it hits a critical threshold, catastrophically releasing in an earthquake. All of this happens slowly: tectonic plates move just 1 to 8 inches (3 to 20 centimeters) per year, or about the same rate that your fingernails grow. The west coast is a tectonic boundary where the Pacific Plate shoves up and into the North American Plate. Earthquakes are common all along the west coast, but not always for the same reasons. Where land meets ocean in southern and central California is a transform boundary: the Pacific Ocean (and a snippet of land tucked on the oceanic plate) has transverse motion as it makes its way north with minimal spread or compression. Yet from northern California into the Pacific Northwest is a subduction zone, a convergent boundary where the oceanic plate dives beneath the continental plate of North America. These differences in relative motion—sideways versus collision—have dramatic consequences on the types of earthquakes they produce. Transform zones like in California, Haiti, or Pakistan are home to mostly strike-slip faults, places where the ground slips left or right with very little vertical motion. The earthquakes are typically shallow, which concentrates shaking more intensely in a smaller area. These earthquakes devastate cities, not entire regions. The primarily horizontal motion prevents them from spawning tsunami — enormous waves that cross entire oceans, inundating the shore to leave a flood of devastation — unless a landslide triggers a local event. Classic transform zones have frequent earthquakes that can be large, yet not enormous. Serious, damaging earthquakes of magnitude 6, 7, or even pushing near 8 strike every decade or so, while smaller yet distinctly felt earthquakes of magnitude 4 or 5 strike each year. The story is much different to the north where plates collide. The denser plate dives into the planet while the lighter plate buckles during the collision. The deformation means plates can stay locked longer, building up stress over far longer timespans. Consequently, earthquakes are far less frequent, but have the capacity to be truly enormous. All the largest earthquakes in history occurred in subduction zones like Chile, Alaska, Sumatra, Japan, Peru, and the Pacific Northwest. These megaquakes can also be far deeper in the Earth. This spreads the shaking over a larger area. Paired with the greater magnitude, subduction zone earthquakes can devastate entire regions. The vertical motion can also trigger tsunami. Everyone who lives in earthquake country talks about the inevitable Big One, the worst case scenario of the largest earthquake striking and releasing all the stress pent up since the last Big One. This summer’s disaster blockbuster San Andreas took California’s Big One to extremes. Yet for all the fun of ramping up a killer earthquake beyond all plausibility, in that crazy over-the-top fantasy world a major earthquake further north would have somehow been worse. In reality, transform zone earthquakes are plenty nasty without exaggeration. Earthquakes spawned by the San Andreas Fault burned San Francisco to the ground in 1906, and shocked the world when viewers of the ‘89 World Series watched Candlestick Stadium rumble in the Loma Prieta earthquake. To the south, the 1994 Northridge quake revealed a new branch of the fault system previously buried under sediments of the Los Angeles basin, collapsing buildings and overpasses. These earthquakes were all catastrophes with substantial loss of life and damage to the cities, but they have a hidden silver lining in their frequency. Everybody knows California is earthquake country, and everyone who lives there has their own anecdote of the time the earth shifted beneath their feet. This is often enough for people to keep preparedness high for the most part, and remember to respond without panicking. Meanwhile, the infrequency of earthquakes in the Cascadia Subduction Zone is a mixed blessing. Residents of subduction zones can blissfully go an entire lifetime without experiencing a substantial earthquake, and entire generations can pass between the most devastating megaquakes. The gap can be so long that newcomers may easily not notice they’ve just emigrated into earthquake country. Awareness is low, and personal preparation is often postponed or inadequate as people flat-out forget they should even consider earthquakes. We know from Japanese tsunami records that the last truly catastrophic earthquake in the Cascadia Subduction Zone hit on January 26, 1700. The return period is a few centuries between megaquakes, so awareness is growing that the Pacific Northwest should prepare for the next Big One. Yet without personal experience to reinforce urgency, it’s hard to spend time, money, and effort on mitigation and preparation. For the people of Los Angeles, yesterday’s tremor was yet another frequent reminder to secure heavy furniture and update grab-and-go bags. For Vancouver’s rarely-rattled residents, it was a wake-up call that earthquakes in the region are more than theoretical. For both, it was a real-life earthquake drill to see who remembered to drop, cover, and hold on during the shaking. Did you feel the earthquakes? Fill out a Did You Feel It? report for Los Angeles or Vancouver, then tell us your story! 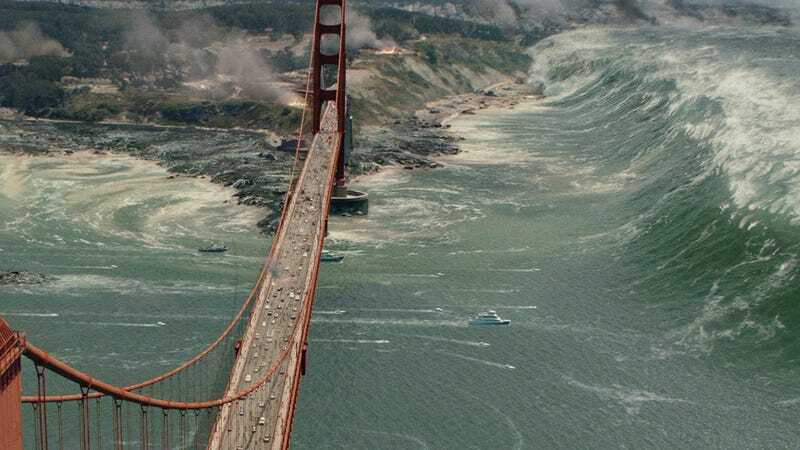 Top image: Despite what you saw in San Andreas, the fault really can’t produce earthquakes massive enough to trigger a Golden Gate Bridge-swamping tsunami. Credit: Warner Bros.